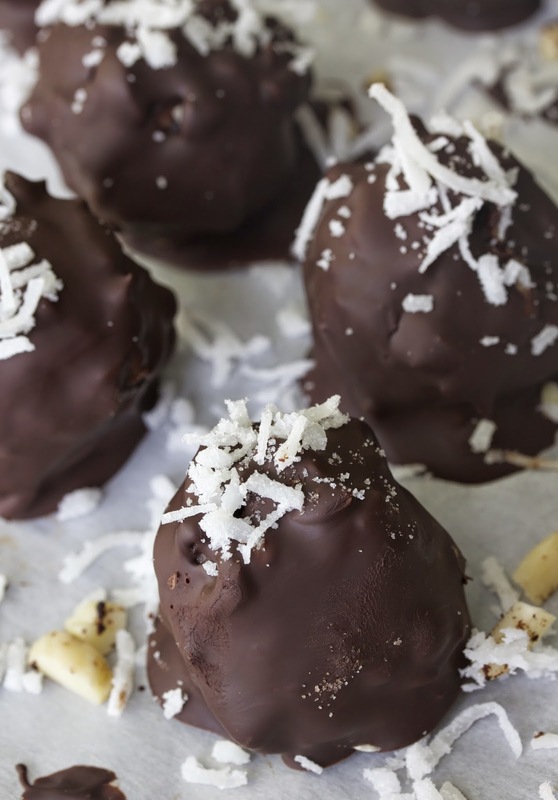 "Nothin’ says lovin’" like a gift of homemade chocolate truffles. Adapted from a recipe* on The Foodie Teen website, these candies were a delicious birthday treat for a dear friend. 1. Boil 2 cups of water in a pan. Add 3 tablespoons of baking soda. At 3 1/2 minutes, take one out and put it under cold running tap water. If the skin peels off, the rest of the nuts are ready to be drained in a colander, with cold water running over them as they are peeled and put aside. For a good video on this, see http://www.mybakingaddiction.com/how-to-peel-skin-hazelnuts/. 2. When the hazelnuts have cooled down, dry them with paper towels, and grind them in a food processor. 3. In a medium bowl, combine the ground hazelnuts, vanilla extract, cacao powder, agave syrup, coconut oil and almond milk until combined. 4. Place in the fridge for 20-30 minutes until firm. 5. Scoop up the mixture with a mellon baller or small spoon and roll it into a ball with your hands (should make 24 balls). Insert the half macademia nut into the bottom of the ball and cover over with the mixture. Roll each ball in the chopped slivered almonds until it is coated with nuts. Place each one on a small cookie sheet covered with parchment paper. Place in the fridge for about an hour to harden. 6. Melt the chocolate bars in a small pan that has been placed over a pan with 2” of boiling water in it. Dip each truffle into the melted chocolate to cover it, and place back on the parchment paper. Sprinkle the tops with sweetened shredded coconut (optional). 7. Put the tray back in the fridge for 10-15 minutes to set up. Carefully remove each truffle to a serving platter and enjoy! Makes 24 truffles; extras can be stored in an airtight container in the fridge for up to a week.